Turkish army and Free Syrian Army (FSA) units have taken “entire control” of Afrin city center in Syria’s northwestern Afrin district as part of the ongoing “Operation Olive Branch,” Turkish President Recep Tayyip Erdogan said on March 18. The units entered Afrin at 8:30 a.m. on March 18, and the Syrian city was under control on the 58th day of the operation, with Turkish and FSA flags raised, Erdoğan said, speaking at the commemoration ceremony of the Gallipoli Campaign during World War One in the northwestern Çanakkale province. Turkey will immediately take the necessary steps to make sure the residents of the city are able to return to their homes as soon as possible, he said. “The terror corridor has been broken on four fronts,” the president said, referring to attempts by the People’s Protection Units (YPG) to establish a corridor along the border with Turkey. The operation has taken the “utmost care to protect civilians” because the army does not aim to make an “intervention, but achieve peace” and “eradicate terrorist groups,” Erdoğan said, noting that Turkey would take all necessary steps to rebuild Afrin’s infrastructure while clearing any signs of “terrorists” from the city. “We will take all necessary steps to bring the people of the region living in our country or other places back to their homes as soon as possible,” he said. Turkey launched “Operation Olive Branch” in Syria’s Afrin district on Jan. 20 to clear the region of the YPG, a group Ankara sees as a terror organization for its links to the outlawed Kurdistan Workers’ Party (PKK). Erdoğan said a total of 3,603 militants have been “neutralized” since the beginning of the operation. Turkish authorities often use the term “neutralized” to refer to injured, killed, captured and surrendered militants. Authorities said 46 Turkish soldiers had been killed and 225 injured. “Most of the terrorists have already fled with their tails between their legs. Our special forces and members of the Free Syrian Army are cleaning the remains and the traps they left behind,” Erdoğan said. 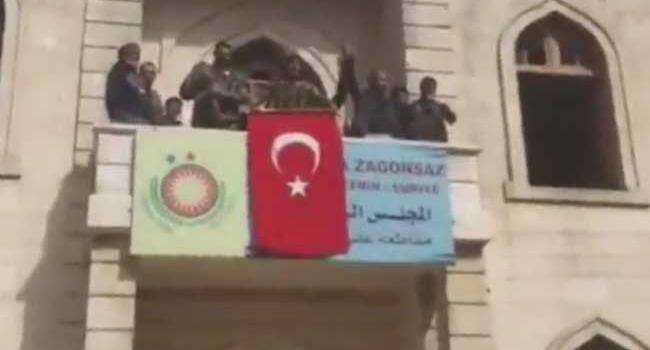 “In the center of Afrin, symbols of trust and stability are waving instead of the rags of terrorists,” he added. “Afrin town center has come under the control of the Turkish Armed Forces and Free Syrian Army,” the Turkish General Staff said on its official Twitter account. “This is a gift for those who were martyred on March 18,” said a Turkish soldier as he waved the national flag in the video. Search operations for mines and improvised explosive devices are underway, it added. A spokesman for the FSA also said they entered Afrin before dawn, meeting no resistance. A war monitor, the Syrian Observatory for Human Rights, said pockets of YPG militants were defying orders to withdraw, but Turkish forces were in control. FSA spokesman Mohammad al-Hamadeen said the fighters had entered the town from the north, east and west. “Maybe it will be cleared by the end of the day – it’s empty of [YPG] fighters, they cleared out,” he said. Turkish government spokesperson and Deputy Prime Minister Bekir Bozdağ said the military campaign would continue to secure areas around Afrin and make sure food and medicine were available. “The message to terrorist organizations and to the whole world is clear: Turkey will continue to move forward with steady steps on the path of trust, stability, and justice,” Kalın said in a message posted on Twitter. More than 150,000 people have fled Afrin in recent days, the Syrian Observatory said.